Spring has well and truly sprung, and the keen eyed among you will have noticed many birds with beak-fuls of nesting material in recent weeks. Those of us who put out nest boxes earlier in the year are keeping our fingers crossed that we’ll see them occupied this breeding season. If you’ve been following our campaign to give nature a home in Glasgow will know that one of the birds we’re concerned about is the house sparrow. These charismatic birds were once widespread in cities like Glasgow, but have undergone a dramatic decline in numbers since the 1970s – by as much as 90%! So we’ve been recommending a number of ways to give them a hand. 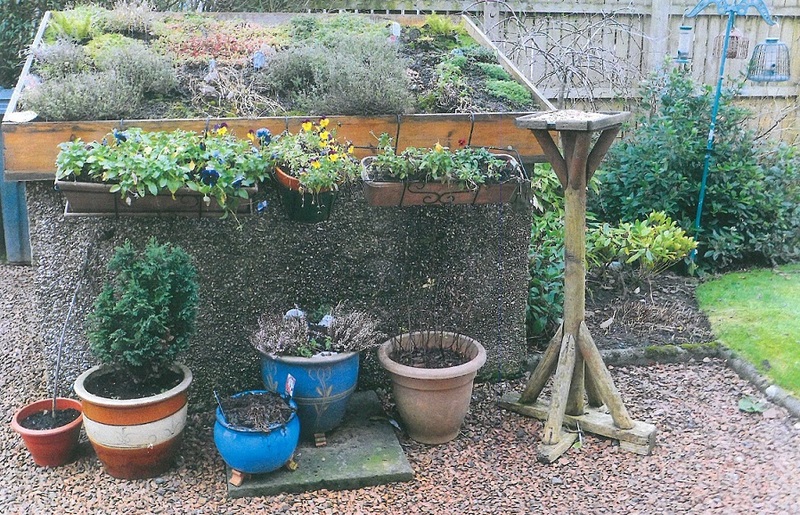 One of our volunteers, Alan McKell, has galvanised his neighbours and has transformed his shared garden in Giffnock, in the south of Glasgow. 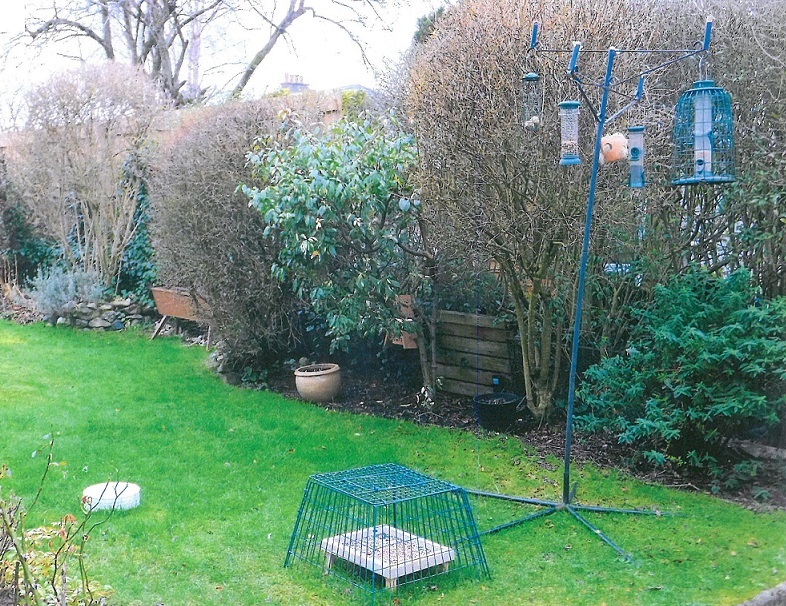 After moving in to a new flat in 2013, Alan reinstated a bird-feeding routine, noticing that feeders in the shared garden had become neglected and unused. After trialling a range of feed mixes, Alan settled on a winning formula and quickly clocked up 21 species of birds visiting the garden, but no house sparrows were to be seen. After scouting out his local area, a house sparrow colony was found 300 yards away in a garden with lots of cover. As the project to ring sparrows in Partick has illustrated, house sparrows don’t move great distances, preferring to keep to their patch – and so it was the case here, with the sparrows never moving further than 3 or 4 gardens away from their territory. By May 2014, the first house sparrows were seen in Alan’s garden and they began to nest in the roof of the building, visiting the feeding station regularly. Alan first volunteered for RSPB Glasgow’s house sparrow survey in the summer of 2014, where it became clear that the sparrows in his garden were a separate colony from the one first identified. Alan’s next step was to take inspiration from the RSPB’s Nature’s Home magazine to further develop a wildlife-friendly garden. Nest boxes, bug hotels, a bird bath and water dish were installed, organic nesting material was placed in the garden and a decision was made to reduce visits by the gardener. The grass was allowed to grow a little longer, a few areas were left to go wilder, and the ‘hedge pledge’ was taken (not to trim between March and August) to ensure adequate cover – fewer visits from the gardener also had the added bonus of saving money! The icing on the cake was the creation of a green roof for the bin shelter in the Spring of 2015. After constructing a heavy timber frame, Alan sought advice from a local garden centre on the best plants and compost to use. A variety of species were planted to give an array of foliage, textures and scents, which would flower in sequence to maximise colour and interest for both humans and wildlife alike. Sedum, dianthus, aubretia, campanula, phlox and thyme were some of the species planted – more tips on planting for wildlife gardens can be found on the RSPB’s A to Z of a Wildlife Garden. One challenge has been to deter predators such as cats, hiding in the bushes close to the feeding station, but after the purchase of an ultrasonic ‘Catwatch’ deterrent from the RSPB, this was soon remedied. Although sparrowhawks, magpies and herring gulls pay visits to the garden, there has been no evidence that they are causing any major problems for the sparrows, which could be down to the cover provided. Research from the sparrow survey recently revealed that sparrows prefer to feed within around 1 metre of cover for a quick getaway. Incidentally, the more you trim your hedge, the tighter the structure becomes, making a quick escape that much harder for sparrows and other garden birds – taking the ‘hedge pledge’ and refraining from cutting over the Spring/Summer can really make a difference. 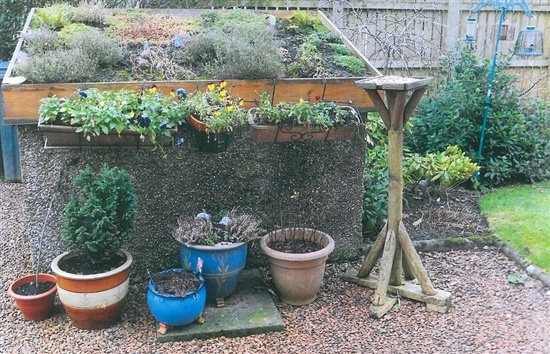 Alan’s plans for the future include bedding in more plants including hedging plants and wildflowers – the latter will prove beneficial food sources to sparrows by attracting bugs in the summer and providing seeds in the winter – and perhaps greening the block’s flat garage roof. If Alan’s story has inspired you to give nature a home, you can find hints, tips and activities on the RSPB website. Why not share your creations with us on social media by posting on the RSPB Glasgow Facebook page or by tagging @RSPBGlasgow on Twitter or by using the #homesfornature hashtag.